Does your child have Sleep Apnea (Airway Issue) or have narrow upper jaw? What can Expander do for you? 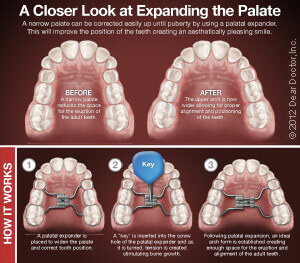 Some patients require expander in their orthodontic treatment. They have a narrow upper jaw that requires expander to push out the upper jaw sideways, loosening up the locked bone that is located in the mid section of the roof of their mouth. The upper jaw is also connected to the nose, which allows the expander to open up the nasal airway. Thus, if your child breathes through their mouth or has snore/sleep apnea, expanders help open up his/her airway. However, there is a window for this appliance to work. The bony lock become solid with age and will not work with expander alone after a certain age. Girls’ bone mature faster than boys’ and the window for expansion close sooner than boys. Also, when your child needs braces after the expansion, there will be a waiting period of 4-6 months, since the loosened gap between bones will need some time to fill up before we move patients’ teeth. There are different types of expanders, but the most popular ones are the ones that bands go on the upper molars and have arms extending to the front. We ask parents to use a key to open up the expander. Depending on the severity and age of the patient, we may ask to turn every other, every or twice a day. These turns will push the teeth apart, in turn pushing the bones sideways on the upper jaw. This will create space for the upper jaw as well. Please call us to schedule a free consultation if you live in or proximal to Redmond, Woodinville, Duvall, Sammamish and Carnation. We are located at Redmond Ridge in QFC mall. We are just ten minutes away from Redmond, Duvall, Carnation, Sammamish and Woodinville Downtown. Don’t like Head Gear? Any other appliances to help bite correction? There is an appliance—called Carriere Motion—that we place to substitute Head Gear. Head Gear definitely does help by modifying skeletal growth and providing dental movement, however, it is not the first choice for most parents and kids because of its image and esthetics. Many parents mention about how awful their experiences were with Head Gear wear and ask if there are other ways to fix the bite. Carriere Motion is another appliance we use to help patients with bite issues. Carriere Motion does not provide Skeletal effect, but addresses dental issues very effectively. If you have concerns because of Overjet—the distance between the upper and lower front teeth; layperson calls it overbite—it will help you with bite correction. The appliance is placed before you or your child gets braces or Invisalign. The appliance is only attached to the upper eye teeth and molars, and the patients wear rubber bands to the hook on the lower molars. Correcting the bite is time consuming with braces, however with Carriere Motion bite correction is more effective since you are only targeting the correction rather than straightening teeth at the same time. Moreover, kids are more motivated since they are most compliant during the first couple months of treatment. However, rubber band wear is crucial for the appliance to work—just like Invisalign. Once Motion is in for 3-6 months, patients will just need braces for about 12 months. Since you did the heavy lifting—meaning bite correction—with Motion first, your total time with braces or Invisalign is reduced, which means less time for you or your child to worry about food, hygiene and emergencies with breaking braces. If you have animals—especially dogs, cats and pigs—in the house, make sure you keep your retainers inside the retainer box or at least a safe place—where your pets can’t access. Since retainers are made of plastic materials, it reminds them of their chew toys. Pets will start chewing, nibbling and playing with them—leading to a partial/total destruction. Retainers are customized to your teeth so a small tweak in the wire or plastic will not fit or fit in a wrong way, moving your teeth in an unwanted direction. I’m sorry, but you will have to say bye-bye to your retainers! If so, you would need to call your orthodontic office immediately to have new retainers since now it’s your responsibility to keep your teeth in a great condition after after the braces are removed. As said, retainers need to be worn lifetime! Retainers are just as important as having braces. Your teeth are in great shape, and now it’s your duty to keep them there. You need to wear your retainers exactly following your orthodontist’s direction. If not, your teeth will move again. Its better to be safe than sorry, since now you paid your due of having braces or Invisalign 2-3 years. If you don’t wear your retainers you will highly likely need get braces again. I don’t think anyone would want to get braces all over again! You definitely want to make it worth what you paid for. One thing you should know is that your retainers should be worn permanently– not just for a period. Once you are ready to get braces taken off, you will get retainers. Removable retainers can be made of clear plastic material or hardened plastic material with wires. Retainers help to prevent your teeth from moving back when the braces are taken off. Patients tend to lose or break their retainers often because they misplace them, accidentally throw them away, or they may place them where the dogs can easily find them– Uh oh! Retainers are considered perfect chew toys for dogs– kind of expensive though. Whenever you are eating please don’t wrap the retainers on a piece of napkin!! Highly likely you may throw away your retainers with the trash at the end of your meal. That’s one of the most common mistakes patients make. Always put them inside the retainer box that was given to you. When you have braces on for the first time you may feel every discomforts may be emergencies, but sometimes that may not be the case. There are so many ways to avoid coming into the clinic by learning a couple of tricks that you can do at home. First of all, your mouth will take some time to get used to having braces on. The brackets will rub inside your cheeks and lips. The brackets may irritate your mucosa (mouth skin) causing it to feel sore. The wax that we provide to the patients is used to prevent that from happening. Once you feel like the bracket is making your lips or cheek irritated, use the wax right away. You will need to take it off when you eat, but don’t forget to put them on right away. You will have to place the wax for couple of days so that you can give some time for the mucosa to heal. In addition, you might run into wire poking situation. Because your teeth are straightening, the wire tend to get longer at the early stage of braces. Sometimes, the wire tend to shift as well. To prevent the wire from poking you, you can use wax and roll it into a little ball and place it on there. Also, you can actually use your thumb nailbed to push it to the other side. Hope this blog helps you. Happy Holidays! Everyone hears different stories from their friends and family members about how their teeth felt the day after getting their braces on. I used to have braces so I can tell you how my experience was and how my teeth felt afterwards. The next day after I got my braces, my teeth felt quite numb and uncomfortable. It was difficult for me to eat foods, let alone talk with them. I made sure that I ate very soft foods like soups, mash potatoes, and lots of milkshakes as I was told by my orthodontist. I’m quite sure everyone will agree, we need more excuses to drink nice cold milkshakes. In fact, milkshakes did help my teeth feel better. The numbing sensation on the teeth is very normal because once you get your braces tied to the wire, teeth start moving right away. However, the good news is that you get used to it within 2-3 days. Soreness actually means your teeth are moving. Same type of muscle soreness you feel after playing sports. So if you do have some uncomfortable and numbing sensation on the teeth afterward you get your braces, no worries—it is completely normal. Just go grab yourself a milkshake and you’ll be just fine! Would I be a candidate for clear braces? Yes, most patients will be able to get clear braces. 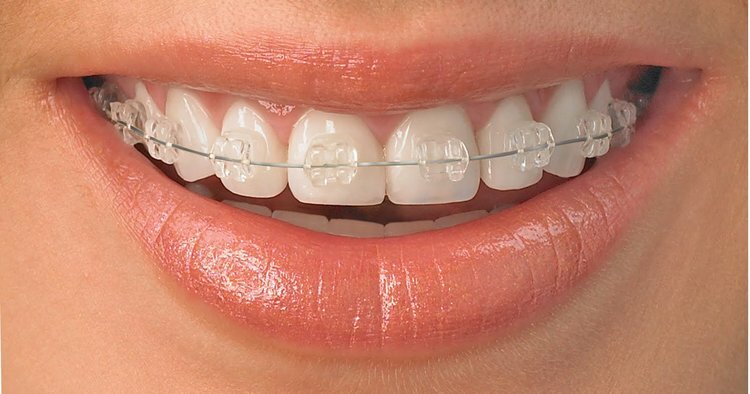 However, clear braces have their pros and cons comparing to metal braces. Clear braces are definitely more aesthetic, comparing to metal braces. They do blend in with natural teeth color very well. However the downside about getting clear braces is that they tend to move teeth slower comparing to conventional metal braces. Because of the material itself, teeth tend to move slower with clear braces. Also clear braces tend to be more brittle than metal braces, meaning the portion of the bracket may break during the treatment, requiring replacement of the bracket or causing issues when colors are placed. With clear braces, we can move teeth with decent speed—but not as efficient as metal braces. Thus if your teeth require complex movement and you want to get orthodontic treatment done fast, you may not be an ideal candidate for clear braces. However, in most cases, clear braces will be a nice esthetic option if you don’t want metallic smile for years. Please call us to schedule a free consultation if you live in or proximal to Redmond, Woodinville, Duvall and Carnation. We are located at Redmond Ridge in QFC mall. We are just ten minutes away from Redmond, Duvall, Carnation and Woodinville Downtown. One thing that catches people’s attention when they are looking around to get braces are the types of foods that they can or can’t eat with them. You can still have some of your favorite foods, but you have to be careful on what you choose to eat. The brackets are glued on to the teeth so they can pop off depending on what you eat. Avoid eating things that are solid, hard, sticky, crunchy and chewy foods. For example, biting on carrots, apples, ice, chips, taffy or caramel may end up breaking your bracket or bending the wire. Before eating, think twice about what you can eat. There are many things that you can still eat and still be able to enjoy such as muffins (no hard whole nuts), ice cream, soft cookies, mash potatoes, pancakes, soft meats like chicken, salmon, and fish. Eat soft foods so that you can avoid coming to the clinic for an emergency appointment. So remember— avoid the hard foods and enjoy the soft foods! Why do we use rubber bands when we have braces on? That’s one of the most common questions that people ask themselves when they are in the process of getting braces or have braces on. Most people think that getting braces is to straighten the teeth and to have a beautiful smile. Not only is that true, but braces also help to adjust the bite as well and that’s were the rubber bands come in. The rubber bands connect to the bracket on the upper teeth to the lower teeth. As you wear them, the rubber bands move the teeth to adjust and improve the bite. When your orthodontic asks you to wear your rubber bands 24 hrs a day , make sure to have them on for that long. Its better to follow the instruction because it will help the process of the teeth adjusting. If you wear the rubber band on and off teeth will move to the direction you want and move back to the original position—thus, you need to wear the rubber band as told. My teeth were straight when I was young. Why am I getting crowding later in life? As an orthodontist, I see many adult patients who come to see me because of their late crowding. Most of them mention that they had a nice teeth alignment when they were young, but now crowding is developing and worsening. In the past, dentists believed that this late crowding is caused by wisdom teeth. They believed wisdom teeth are putting pressure against the adjacent teeth, which again put pressure on the front teeth. Interestingly, evidence based studies have proven that this late crowding is caused by continuous (yet gradual) lower jaw growth and forward movement of our molars (back teeth) and not by our wisdom teeth. One more reason for you to want to wear your retainers permanently. Does this mean that we should leave wisdom teeth even when there are no room for them? I do still recommend patients to get their wisdom teeth checked out for removal if there are no space for them to come in. This way you can prevent future complications associated with impacted wisdom teeth. It is better to be safe than sorry, when we put so much time and effort to correct your teeth. Do you do Invisalign on Teens? In fact, I do prefer Invisalign on teens rather than braces on many of them. However, parents tend to get concerned whether their children would wear the Invisalign aligners. Since the success of Invisalign treatment highly depends on children’s compliance with aligner wear, parents tend to lean towards conventional braces. However, many teens prefer Invisalign over braces due to obvious esthetic reason. Invisalign do require some attachments, but they are minimally visible comparing to braces. Interesting enough, most teens decide to wear the aligners because they rather not get braces. Moreover, teens prefer Invisalign because of non-existing food restriction. They can enjoy eating any foods they want with Invisalign. This again leads to minimal emergency visits as there will be no wire-poking or bracket breaking emergency appointments. Finally, teens prefer Invisalign, because they can easily keep up with oral hygiene. With Invisalign, brushing and flossing will be exactly the same as before. However, Invisalign comes with responsibility as well. Invisalign patients really needs to be compliant about wearing the aligners and rubber bands. Patients need to wear the aligners 20-22 hours per day to straighten their teeth. In addition, they will need to wear the rubber bands in order to correct their bite. Now you have all the information about Invisalign/ Invisalign teen. Parents, children and the orthodontist can make a decision all together to see if Invisalign is an option for your child. We do Invisalign on many teens. If you reside in our local community, such as Redmond, Carnation, Duvall and Woodinville, feel free to give us a call for a free consultation to find out if your child is a great candidate for Invisalign teen. Is it too early to schedule an Orthodontic Consultation for my child? Lots of parents ask me whether their child is ready to be scheduled for an orthodontic consultation. As the American Association of Orthodontists recommends, I would recommend parents to schedule an orthodontic consultation for their child from age 7. This does not mean all the children will need to get braces at this time. You can visit your local orthodontic office and meet the staff and doctor. This will help your child be prepared and excited when they are ready for braces, since orthodontic offices provide fun environment. On top of that, your orthodontist will monitor eruption and growth of your children’s teeth, informing you when is the best timing for your child to get braces. However, if your child needs help with his/ her bone growth, your orthodontists can use this growth-window to achieve better result. When patients have cross-bite, underbite or open-bite, orthodontist can address the issues better when the bones are less solid. We, orthodontists, also start early treatment when we see that the child’s current bite may cause any irreversible damages on his/her oral health. When a child has bite that can damage the supporting tissues or are has an accident-prone bite we tend to start early treatment. There may also be other indicators that require early treatment. Again, even though your child are not ready to get braces, it is a great way to build rapport with your future orthodontist. Please call us to schedule a free consultation if you live in or proximal to Redmond, Woodinville, Duvall, Carnation. Does my child need two phase Orthodontic treatment? It’s a common question I get as an Orthodontist. And as a parent, I understand how daunting it can be to face the time and expense of a two phase process. So why is a two phase treatment sometimes used? First some definitions are in order… In Orthodontics for children, there are two different phases of treatment. One is called Phase I, Early treatment, the other one is called Phase II, Comprehensive Treatment. Most children do no require Phase I early treatment and will do well with just Phase II comprehensive treatment. On the other hand, some children may have severe bite problems that may require Phase I treatment to intercept the bite issues. In these situations, we use Phase I Orthodontic techniques to correct the urgent issue which may irreversibly damage the teeth or gum if left alone. We also go in earlier if there is a need to facilitate favorable growth including when sleep apnea is a concern. The two stage process may seem daunting but luckily, Phase I treatments are often short. And treatment times are optimized by limiting intervention to correct the most pressing problems then waiting until majority of the child’s dental and skeletal growth is complete before finish work is completed. So how do I know if my child needs two phase treatment? Your child’s Dentist can help detect problems as early as age 5-6. However, all children benefit from having an early evaluation by an Orthodontist. To help determine the best course of care for your child, we are happy to offer complimentary expert Orthodontic evaluation for your child. Goal for both treatments are the same. They are both used not only to straighten teeth into their ideal position to create that beautiful smile but they are also used in a very specific way by an Orthodontist to improve facial appearance and promote better function, occlusion and health. The way they go about doing that is vastly different. Invisalign uses a series of clear plastic tray aligners while traditional braces uses wires and braces to accomplish ideal movement. The main benefit is that they are minimally visible when worn and can be removed temporarily when drinking or eating certain types of foods so there are essentially no restriction to what you can eat. They are ideally worn 22 hours a day with removal when eating and drinking. New trays are placed about every 1-2 weeks. Although they have been traditionally used for less complicated cases to achieve good outcomes, with better design and treatment planning, they can now be used to correct more complex orthodontic problems that were only treated with traditional braces in the past. However, there are still certain complex cases that should not be treated with Invisalign. The main benefit is the ability of an orthodontist to precisely impart and control movement in multiple planes including root movement. With more complicated tooth movement including space closure, traditional braces enable orthodontist to move the root/crown of the teeth in a precise fashion. With modern braces and materials such as ceramic tooth colored braces, the visibility of the braces can be minimized. Traditional braces also allows you to choose fun colors or braces designs (Wild Smile Braces) to suit your personality and style! So which is the right choice, Invisalign or Braces? If your bite is not ideal, then Orthodontics can bring about your best smile while improving your oral health. Invisalign and braces are just some of the many tools in an Orthodontist’s arsenal to accomplish the same goals. Ultimately the choice and specific usage of these tools are driven by Orthodontist’s use of their specialized knowledge to diagnose the underlying issues to develop the most appropriate treatment. Every person is unique and only a carefully considered and guided treatment can bring about the best results. A complimentary initial consultation will provide answers to which choice is best for you!